Why make your own ammunition ? This is an essential question. Why bother buying components, find recipes, test many and many combinations when you just go to your gunshop or the web and order all the ammunition possible and unimaginable. The reason is simple. To have the satisfaction of having achieved something perfect by oneself with an efficiency at least as good as industrial products. 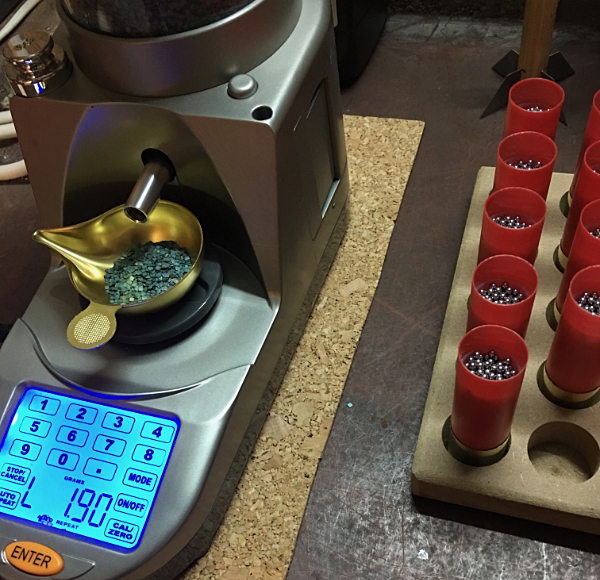 To be able to shot the cartridge that you want, with the load that you want and the shot of very high quality, the new wad discovered in Italy and the fantastic powder that we will look in Luxembourg. In brief, to make tailor-made, exactly the way you hunt, with the best possible ingredients. High fashion. Craftsmanship, watchmaking at the service of quality and regularity. The comparison with a vegetable garden is instructive in this aspect. You do not grow a garden to make money because you can always buy cheaper vegetables at the supermarket. On the other hand, they have better tastes, we are sure of the way they were produced and above all, we are proud to be able to eat OUR tomatoes from the garden. We appreciate them all the more because they gave us hard work and the result is delicious. What a pleasure to taste a tomato pie prepared with beautiful fleshy tomatoes and very ripe, with this unique taste of home made. The handmade cartridges are a bit like that. We appreciate when we shot them, often with more moderation than with manufactured and, when we have a positive result, the pleasure is immense. This is especially true for small caliber cartridges. To take a game with 28 gauge, for example, is already difficult but when it is with its own cartridges, it is the thrill guaranteed! Contrary to what one might think, there is no need for much to start having fun. A very precise scale for the powder, cases, powder, various types of fillings, shot, lock cards and an old hand crimper make it very well for you to make excellent cartridges. Then, when you have reached the limits of this material, you could eventually be able to invest in a press that will allow you to make star crimps but it really is not mandatory. the system is much easier to automate. And that, explaining that the roll crimps could cause holes in the pattern, which the crimping star did not cause in any case. It's a perfect marketing plan. The reality is that roll crimps are probably the easiest to do for the individual, give excellent velocity regularity (better than an average star crimp) and, with the use of good breakable cards, only very rarely holes in the pattern. the wad that does not open properly, which happens quite often. speeds too high which provides : shot deformation, difficult passage in the chokes, disturbance of the wadat the exit of the barrel by the combustion gases. So you have to attach a major importance to the quality of the components you use, in the first place the shot that must be the hardest possible (with why not buffer), second the wad must be of excellent quality, with constant thickness and pre-sliced . Finally you will target your cartridges to find the speed that will give you the best grouping with your weapon and its chokes. By following this procedure, you will get results that no commercial cartridge will achieve. There is a real interest in making one's own cartridges. The assurance of having the ammunition best suited to his weapon and therefore to be able to take the game as cleanly as possible but also and especially the pride of using his own ammunition, created in his own workshop with the best components and which will give you exceptional results. No need for a lot of equipment, a hundred Euros and you can begin to enjoy yourself, apart from hunting, to test and make your little jewels.